For this exhibition Giovanni Anselmo will exhibit new work in the North Gallery. "Il Panorama Verso Oltremare Intorno E Dove le Stelle Si Avvicinano Di Una Spanna in Piu" ("The Panorama Towards "Oltramare" and Where the Stars are Coming One Span Nearer") continues his vocabulary of granite and panels of ultramarine blue paint. In the North Gallery viewing room, there will be six drawings, studies for his 1965 work "La Mia Ombra Verso l'Infinito Dalla Cima Dello Stromboli Durante L'Alba del 16 Agosto 1965" ("My Shadow Towards the Infinity of the Peak of Stromboli During Dawn, August 6, 1965"). 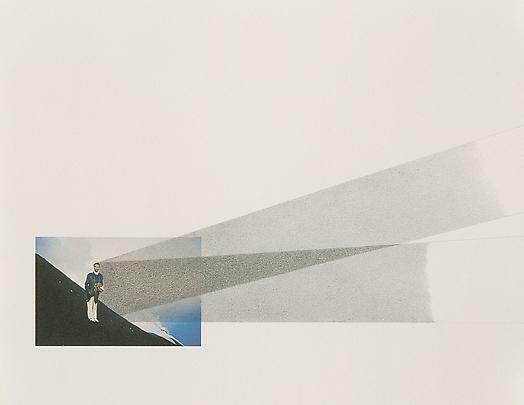 This was a seminal photographic work made in the mid-sixties on an excursion to Stromboli (a volcanic island to the north of Sicily), in which Anselmo climbed to the top of a peak, then waited for the first rays of the rising sun to flood his figure with light, and projected his shadow into infinity. 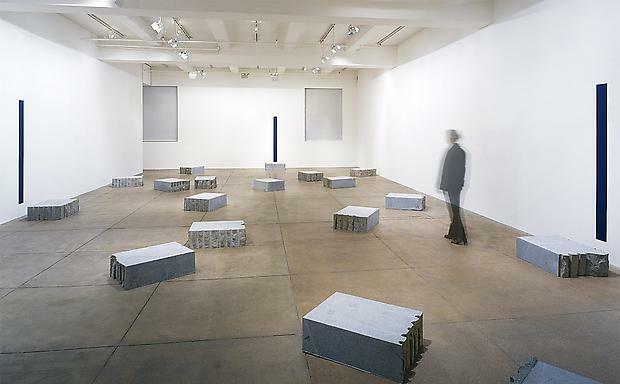 For the past thirty years Giovanni Anselmo's work has been best known for its association with arte povera, and for its interest in nature -- its force, weight and gravity; material, mass, and energy - and the global landscape itself. Often relating already executed works to new pieces, Anselmo has returned again and again to an iconography of man and nature, creating an anthology of works which has at its core the idea of the itinerary as a conceptual strategy. 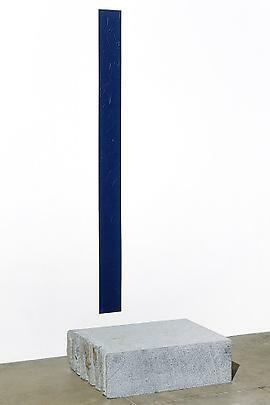 The notions of direction and orientation, the force behind an action, walking and seeing, perception and vision itself, are of interest to him both poetically and compositionally, and can take a variety of forms: a path of earth, a granite fragment, a compass in a landscape, a stony arrow, or a conceptual rectangle of paint in blue (for Anselmo, ultramarine blue is symbolic as the color brought to Europe from the East, from "overseas"). Giovanni Anselmo was born in Borgofranco d'Ivrea, Italy, in 1934, and lives and works in Turin. His work has been widely exhibited internationally at such museums as The Rennaissance Society, Chicago; the Musée d'Art Moderne et D'Art Contemporain, Nice; Centro Galego de Arte Contemporanea de Santiago de Compostela; ARC, Musée d'Art Moderne de al Ville de Paris; the Stedelijk Van Abbemuseum, Eindhoven; the Musée de Grenoble; the Kunsthalle Basel; and the Neues Museum, Weimar. He recently completed a commissioned work "A Homage to Granite - The Island of Sculptures", in Ponteverdra, Spain. His work has also recently been included in group exhibitions such as "Le Temps Vite' at the Centre Georges Pompidou; "Minimalia: An Italian Vision in 20th Century Art" at PS-1 Museum, NY; "Arte Italiana: 1945-1955" at the Museum of Contemporary Art, Tokyo, which travelled to Tottori, Hiroshima, and Taipei; "Reconsidering the Object of Art: 1965-1975" at the MOCA Temporary Contemporary in Los Angeles; The 1988 Carnegie International; "The European Iceberg: Creativity in Germany and Italy Today" at the Art Gallery of Ontario, Canada; and "The Knot: Arte Povera at P.S. 1", New York. Giovanni Anselmo's work is the subject of many monographs, the most recent by Gloria Moure, titled Giovanni Anselmo, published in Spanish and English, on the occasion of his solo exhibition at the Centro Gallego de Arte Contemporanea, Santiago de Compostela (1996).